Potty training is an exciting time for your child. They are growing up and taking pride in being a big kid. Setting a schedule, creating rewards, and helping your child get into a potty routine are important to successful training during the day. However, nighttime potty training has its own rhythm and strategies as your child's body develops and adjusts to the ability to stay dry all night long. But don't fret, and don't put pressure on your child to stay dry all night – follow these tips to help make nighttime potty training less stressful for you and your child. Transition your child to Pull-Ups® Night*Time Training Pants so they can still feel pride in their independent ability to pull them on and off themselves, and not worry about wetting the bed while they sleep. 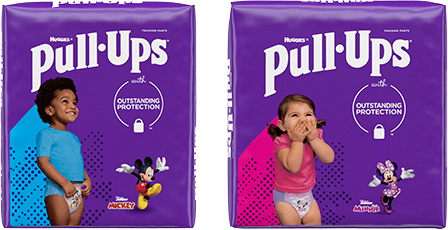 Pull-Ups® Night*Time Training Pants also allow children to stay consistent throughout their potty training journey – even at night – which is important to the journey you’re taking with your little one. Make sure to have a last trip to the potty right before bed. Brushing teeth, putting on pajamas, and reading books are all part of a solid bedtime routine. Now that your child is potty training, be sure to add a regular trip to the potty into the mix. Keep a ready stack of Pull-Ups® Night*Time Training Pants right next to the potty so your child can put them right on after going and keep their bedtime routine moving along. It’s also helpful to teach your child to go to the potty as soon as they wake up. Going to the potty as soon as they wake up helps train your child’s body to add this to their morning routine. Depending on where your child is at in the potty training journey, keep fresh Pull-Ups® or underpants by the potty so they can change right into them once they go and start their day in underpants. The important thing to remember is that nighttime potty training progresses as the signals between your child's bladder and brain develop. It will evolve naturally as your child grows and their body develops, and there’s no trick to speed up the process. What you can do instead is make sure to praise your child's potty success during the day. Eventually, your child's body will catch up, and they will be able to transition to underpants.